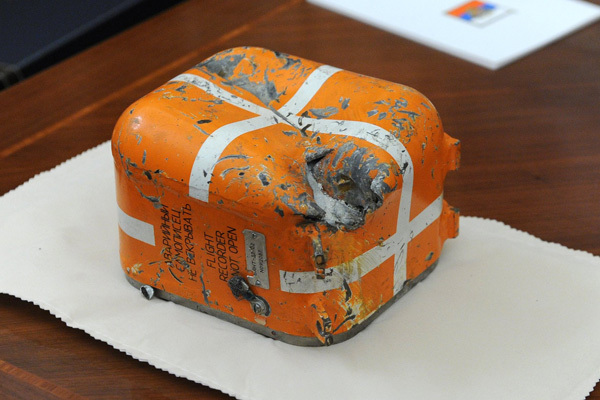 The chances of obtaining information from the black box of the Russian bomber Sukhoi Su-24, which was downed by the Turkish Air Force, are extremely low because of the severe damage to the recording device, says Oleg Smirnov, a prominent Soviet pilot and chairman of the civil aviation commission of the Public Council at Russia's state transport regulator Rostransnadzor. "Based on the available information, we are still looking at this case as one that has no prospects. Chances of obtaining true information are very low because, as was already stated and shown live on air, the damage to the mechanism [the black box] is very serious," Smirnov told Interfax on Dec. 22. There is still a hope of obtaining information from the flight recorder after the crystals of the damaged circuits are examined at the molecular level. "The next stage now begins. This is not an entirely hopeless case. Specialists from the design bureau, which make such products, are to ascertain and take information from the crystals already at the molecular level. This is a very subtle scientific job, we hope for a result. But no one can give a 100 percent guarantee," he said. The black box contains information that might help establish the exact location of the bomber at the time of being hit by a Turkish anti-aircraft missile, he said. "Using the readings that are there, for example, the height, the speed, the flight course - with all these data it is not difficult to determine the location of an aircraft. And that is the most important goal: to prove objectively that the aircraft was over such and such territory," Smirnov said. In his view, the damage to the recording device was caused by the heavy impact a result of the crash, and fire. "The aircraft was falling vertically, at an enormous speed, burning at the same time. All this affects the metal of the aircraft, all the accessories inside the aircraft. Plus, the colossal impact at an enormous speed. All this caused the product to go out of order," the expert said. The fact that the bomber's black box has been preserved after such physical effects speaks volumes of its high viability, Smirnov said. "It is good that this box has survived at all. It points to the high viability of the product, to the fact that the flight recorder is in the right place. But you can't cheat electronics because it is not designed for such pressures and high temperatures, and all that occurred at the same time," the expert said.